The Ocean Ranger was stationed at sea 170 miles east of Newfoundland. Because of inadequate preparations for windstorms 84 lives were lost. The Ocean Ranger, an oil-drilling rig stationed in the North Atlantic 170 miles east of Newfoundland, Canada, encountered a one hundred mph storm on 15 February 1982. Storm waves swept over the uppermost deck and the rig began to list. A few hours later, in darkness, it sank and eighty-four lives were lost. All rescue efforts failed. It weighed 16,500 tons and was the largest self-propelled, semi-submersible, offshore drilling unit in the world at the time. It was launched in 1976 and spent its first three years off the Alaskan coast in the Bering Sea, then was moved to a position off the coast of New Jersey in 1979 where it spent a year before moving again, this time to Ireland. In 1980 it was moved once more, to the Grand Banks, a relatively shallow area near Newfoundland, Canada. 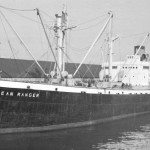 The Ocean Ranger carried a crew of eighty-four and drew oil from the seabed in 250 feet of water. Sixty-nine members of the crew were Canadians. This part of the Atlantic Ocean has large reserves of oil but they are hard to recover because of bad weather. The main supports for flotation and stability were two large pontoons that floated well below the level of the waves. Each was four hundred feet in length, sixty feet wide, and twenty feet in height. They carried most of the everyday needs of the oil drilling rig, ballast water tanks and water for the oil drills, fuel oil tanks, and various pumps, motors, and control valves. Rising from the pontoons to the lower and upper decks were eight watertight tubular cylinders, some forty feet in diameter and others twenty-five feet. Some of these contained the hundreds of feet of chain for the twelve anchors, each weighing twenty-three tons. In one of them, quite close to the waterline, was the control room, often referred to as the brain of the rig. It was here that damage was experienced on the night of the accident. The top deck of the rig was seventy feet above the surface of the ocean and measured two hundred by one hundred and eighty feet. Beneath it was the lower deck on which stood the oil drilling equipment. Balance and buoyancy of the whole vessel were maintained from the control room. Water allowed into a pontoon or removed from it was all that was needed to cope with a list in any direction. An operator was always on duty in the control room. A foreboding of things to come was experienced on one occasion. Captain Clarence Hauss, who had taken charge of the rig only eight days earlier, took responsibility for the control room for a short time in place of the regular operator. A slight list occurred and Hauss tried to make the proper correction. He pressed the wrong button and things began to get worse for a few scary moments until someone made the necessary correction. This experience was typical of the nonpreparedness for emergencies among all the crew. The correct action for Captain Hauss was clearly marked on the control panels. However, he had no way of knowing that there had been earlier problems with the operation of the valves on the pontoons. They were accustomed to behave erratically and brass rods had been installed to make the valves work the way the operator wanted whenever an error was noted in their response to the controls. This was not all that was wrong. Representatives of the oil company had little contact with the daily operations of the rig. They failed to notice that the routine inspection of safety equipment and procedures had not been carried out and the vessel therefore did not have a valid certificate of inspection at the time of the accident. There were no survival suits available on board, essential equipment for anyone operating in the freezing waters of the North Atlantic. Men were hired to work on the rig but were given almost no training and never had the kind of regular boat drill for emergencies that are standard in other vessels. One man who had been on board when Captain Hauss made the mistake told how the crew was immediately called to emergency stations. Everyone was awakened at six in the morning by an announcement telling him to get warm clothing, put his lifejacket on and go at once to the lifeboat station. Two hours went by before the rest of the men responded and finally sixty-five people arrived at this man’s lifeboat that was only capable of carrying fifty-five. This approach on the only occasion when he had to cope with an emergency made him wonder how anyone could escape if a crisis occurred in the middle of the night in the midst of a violent storm. Late on the evening of February 14, 1982, a violent storm reached the Ocean Ranger. Winds built up to one hundred miles an hour and the crew on the lower deck removed the drilling pipe as a precaution. Waves rose to forty feet. By removing the drilling pipe the vessel was free to move and would present less resistance to the wind. One wave broke a porthole in the control room and some water came in. Three hours later, the operator reported to shore that all had been repaired and there was no more water on board. However, damage had been done to the electrical system and two hours after that report lights went out and electricity failed in the control room. The ballast pontoons could no longer be controlled. Standby ships are supposed to be within two or three miles of an oil-drilling rig at all times in order to assist in case of an emergency. Because of the storm, the ship that was supposed to be on hand for the Ocean Ranger drifted eight miles away. When a call for help came from the rig about an hour after midnight this ship was unable to give immediate help. The Ocean Ranger listed ten degrees and an emergency was declared. When the standby ship did arrive an hour later and tried to make contact with one of the lifeboats that had been launched, the boat collapsed and the men were thrown into the sea. The reality of the situation was that neither the Ocean Ranger nor the assisting vessel had any competence for the crisis that arose. An hour later the oil rig capsized and sank taking the rest of the crew down with it. It took two years for their family members to receive some sort of financial settlement for their loss. Ultimately, they did not receive a large amount of money, and legal fees absorbed 30 percent of it, but on the whole it provided for the needs of their children until they were through school. The Ocean Ranger disaster was a great loss to the growing offshore oil industry. The Royal Commission that considered the disaster reported that the engineering design was inadequate and unreliable, especially in relation to the control room. That heart of the vessel should have been able to resist the wave strength it encountered and should not have had its electricity system knocked out. The Commission also criticized operations generally, stressing that management arrangements were very weak. Finally, the absence of any system of inspection by either Canadian or U.S. government agencies was listed as a glaring error. A good example of the way things should have been done can be seen in the Hibernia, a new high tech offshore drilling rig that was built subsequently and placed where the Ocean Ranger had been. The Hibernia was fitted with eight lifeboats, each able to carry seventy-two. Each lifeboat was equipped with launching systems and three life raft systems, thus providing an evacuation capacity for three times the number of personnel on the rig at any one time. Beyond all of this redundancy it was also possible to evacuate personnel directly from the rig to a standby vessel without resorting to launching lifeboats or life rafts into the sea. Today there are three oil-drilling rigs at work off the east coast of Canada, Hibernia, Terra Nova, and White Rose but the new reality, made all the more urgent in the wake of the tragedy of Sikh terrorism in 1985, is more about external dangers than about coping with the weather. New regulations were introduced in 2007 to ensure that no potential terrorist, whether by submarine, surface vessel, or airplane, could approach one of these rigs without being thoroughly checked. These regulations had to be able to override the various local security provisions of the different provinces on Canada’s east coast. Information on potential terrorism, for security, has to be limited to a small number of people. Thus the people with knowledge of threats had to be free to act on preventive action with or without the agreement of local authorities. Rules of this kind were already in place on oil-drilling rigs off the coasts of the United States and Australia but it took some time for Canada to make similar arrangements. The long history of inter-provincial battles over rights led to delays before the new rules were put in place.